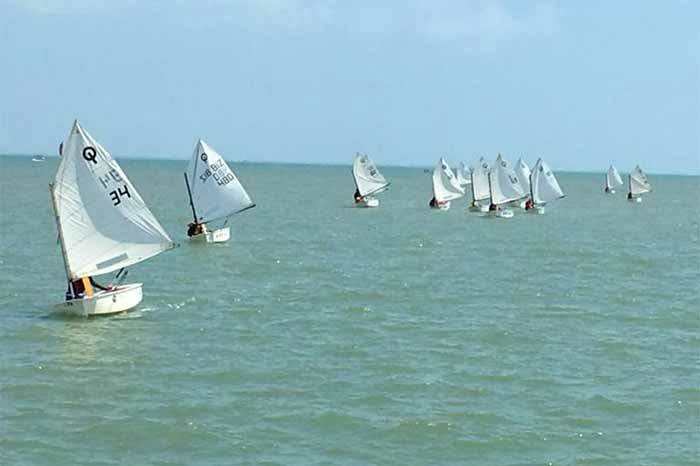 After a three year break the San Pedro Junior Sailing Team has reformed and participated in the 90th Annual Baron Bliss Harbour Regatta in Belize City. The three sailors from the San Pedro Junior Sailing Team were Gabbi Knox, Rosemary Romero and Leroy Arzu. The race took place on Sunday, March 11, 2018, where a total of 12 sailors and four clubs represented and participated in the event. SPJST members all received medals of participation; congrats on a job well done! The “traditional triangle course” with equal sides of one nautical mile was for the Lighters and Multihulls. Separate courses were laid for Optimist and Lasers as both these classes needed ranking points for entry into up-coming international championships. The Optimists needed to get in more than three races so the separate triangular course was laid, shortened to half nautical mile sides with the apex within 100 yards of the BTL park for better spectator viewing. At first light on Sunday, March 11, Belize City harbour began showing white caps, as the seasonal south-easterly strengthened. By sunrise, the few popcorn clouds had sped off toward the land, leaving skies of clearest blue for the 90th edition of the Baron Bliss Harbour Regatta in the vicinity of BTL Park in Belize City. Since the last rains, the water had cleared enough to clearly reveal a pod of dolphins with babies that appeared and stayed the rest of the day with the committee boat. Overhead, osprey, brown pelicans, magnificent frigate birds and gulls fed on mullet and mackerel. 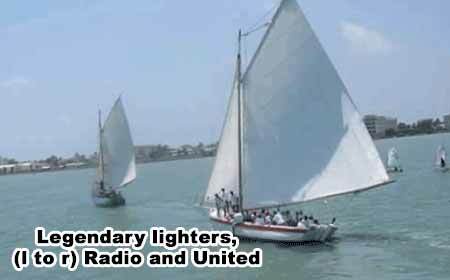 The “traditional triangle course” with equal sides of one nautical mile was for the Lighters and Multihulls. Separate courses were laid for Optimist and Laser, as both these classes needed ranking points for entry into up-coming international championships. The Optimist needed to get in more than 3 races, so the separate triangular course was laid, shortened to ½ nautical mile sides with the apex within 100 yards of the BTL Park for better spectator viewing. Twelve Optimist started at 9:30 a.m., and 5 races later, the results were: Gold Medal 1st Place – Janelle Joseph (12yrs, Caye Caulker); Silver Medal 2nd Place – Darwin Catzim (15yrs, Corozal Bay); Bronze Medal 3rd Place – Adyaneiri “Susie” Teck (13yrs, Corozal Bay); Youngest Female Medal – Mercedes Beckles (11yrs, Corozal Bay); Youngest Male Medal – Cody Bucknor (10yrs, Caye Caulker); Youngest sailor to complete all 5 Races for the “School Sail” Prize – Janelle Joseph (12yrs, Caye Caulker). Gold, and Silver each received an IODA Race Certified sail. All 7 others received Participation medals and Optimist spare parts, including universal joints and flotation bags. Five Lasers put in 4 races resulting in: First Place – Trent Hardwick of St John’s College; Second Place – Wilson Rivera of Placencia. Two Multihulls races results: First Place Hobie – Antonio Ricardez and Manuel Ricardez of Belize City; Second Place Dart 16 – Keith Hardwick and Jabian Young of Belize City. Lighters: Both vessels had agreed to 2 races at 10:30 a.m. and 12:30 p.m. After an hour delay and a false start, the first race went off near midday. Radio started badly and was unable to catch up with United, who won the first race with a quarter-mile lead. The second race started better, but with the wind steadily dropping, United continued to widen an early lead, and finished almost 2 miles ahead of the 133 year- old-Radio. Prize giving at BTL Park for the Optimist and Laser classes were by the Regatta Committee representatives, His Excellency Sir Colville Young; Mayor elect of Belize City, Bernard Wagner; and Chairman Belize Sailing Association, Sharon Hardwick. Prize giving, for the Lighter and Multihull classes was at the Ex-Services Headquarters. The main sponsors of the 90th Baron Bliss Harbour Regatta were: Baron Bliss Trust; Office of the Governor General; Belize Telemedia Limited; Sir Hakimi Karim of Belize Dive Haven; Sea Charters; and Print Belize.